How to pull apart a F&P. 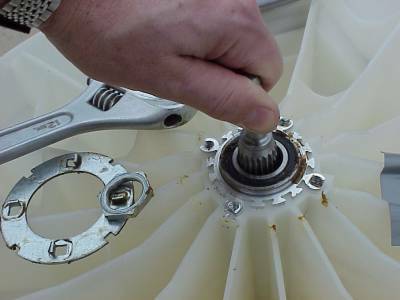 One of our forum members posted some pictures and a description on how he pulled the motor from a F&P washing machine. So I've posted his pictures and instructions here for reference. Looking at the complete assembly from underneath. The transport locking ring (pale thing on the end of the shaft) can be turned anticlockwise while holding the motor rotor steady. 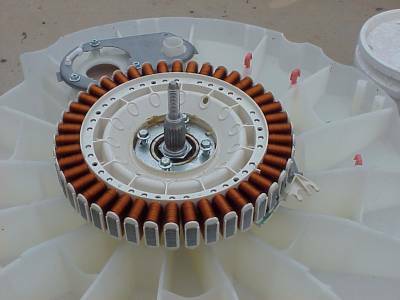 As you turn it, the rotor comes off the shaft, exposing more of the coils. Eventually it is fully undone and can be lifted off. The 4 bolts can be undone, use a 10mm socket. With the bolts undone and the coil assembly removed, the shaft and bearing housing are visible. Hold the shaft with multigrips or vicegrips (use some brass or copper shim or similar to avoid damaging the shaft) and undo the large nut with a large shifter. Don't smack your knuckles into the spanner like I did when it finally lets go. Then ease the shaft down, through and out. 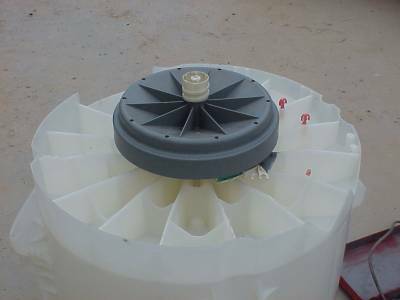 I should mention here that you need to have already removed the washing agitator ( mixer ) and inside bowl. 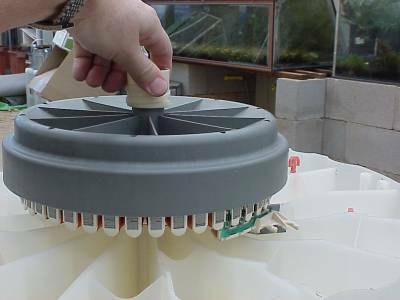 To remove the agitator, take off the filter thing in the middle, poke you hand down inside the agitator and undo the plastic wing nut. 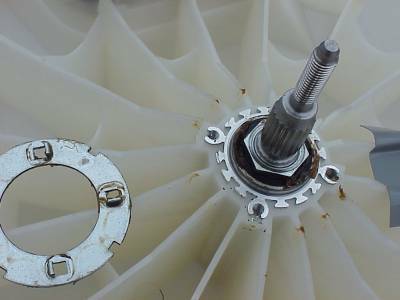 Once the agitator and bowl are removed, undo the seal around the stainless drive shaft, usually held on with 4 screws under all the slime and muck. You must undo this seal before you try to remove the shaft. You can punch out the bearings with a drift. Remember to keep all the bits. Thanks to Ross for the photos and infomation.